I'm not sure if it's a window into my soul but, for me, life is a series of paths crossing, choices, luck (good and bad), and experiences. Part of my life goal, to learn something new every day, is trying to get to know as many people, places, and cultures as possible and to try to never say no to an opportunity. Sometimes all of those things happen at the same time in the same place and the results are pretty amazing. For example, you randomly cross paths with a new person (or maybe happen upon a new place, etc.) and getting to know that person changes you and/or makes you learn something new about yourself. These chance encounters are the chips in the chocolate chip cookies of life. Yummy delicious! 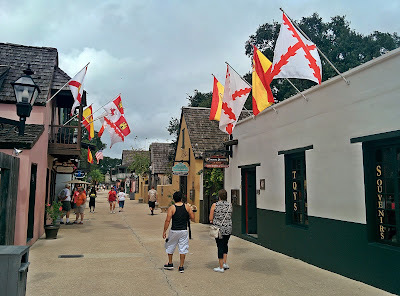 In a sort of life's random-paths-crossing, we were surprised to see the whole town decked out with Spanish flags and red-and-yellow banners. Look again at that photo above. We knew before going that it was founded by the Spanish in the 1500s but, wow, they seem to be a bit Spain addicted or something. Oops. Little did we know when we set out that the whole city was celebrating 500 years since its founding with a big party, which the king and queen would attend. Had we arrived like 20 minutes earlier, we would have seen them on the balcony below. Argh, no wonder there was so much traffic getting into town! Talk about coincidences. It'd be like you live in the United States and you come to Barcelona randomly one day and the president's there. It made for good photos around town with all the bright colors, cool flags, and all. Saint Augustine reminded me, for some reason, of Cape May, New Jersey, which is near Wildwood. Well, and I guess, in a way, La Jolla too. There are lots of cool old buildings, the beach is right there, and it's a lovely place to spend the day. After some time trying unsuccessfully to meet up with the king and queen and then eating a fabulous southern-style lunch, we walked over to the San Marcos fort. Just two weeks earlier(!!! ), we were at the beach in Porto, Portugal, sticking our feet in the other side of the Atlantic! Yes, (we're aware) life's pretty good for this world-traveling duo! But, after all, that's a part of the goal, right? At least for me it is. How to learn and squeeze in as much life as possible into our precious-few trips around the sun? Thanks to everyone who I've met along the route. Yes, the places are great. The food and wine are good too. But, really, at the end of the day, it's the people who make it. Thanks sharing the ride! I'm not Jewish but I heard that rabbis teach that there is no such thing as a coincidence. Being in St. Augustine with the Spanish king and queen in town was certainly no mere coincidence. Great post and excellent pictures.